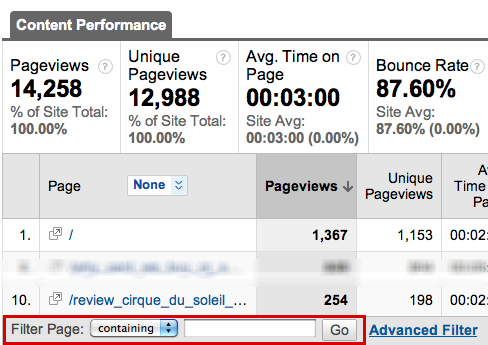 Get traffic stats for a specific page in Google Analytics? I’ve been using Google Analytics for a while and a client just asked me about the traffic on a specific page. I logged into the Analytics site and dug around everywhere, but can’t see anywhere I can actually just type in a URL and find the stats for that specific page. Is it possible, or is that just not how Google Analytics works? When I first read this question, I was pretty convinced that the answer was no, but I asked this question on Twitter (you can follow me to see these sort of questions if you’d like: I’m @DaveTaylor) and found out that there is indeed a way to accomplish what you seek, though it’s so complicated that I asked the chap who shared his info — @robertpatterson — twice to help me figure it out. Fortunately I was taking screen shots as I went along, so I think you won’t find it quite so baffling. The ironic thing, however, was that my first test was to figure out how often people visit the Ask Dave A Question page, just to realize that it was one of the pages I’d forgotten to include the Google Analytics code in the first place, so… no traffic data at all. For this demo I opted to look at my parenting blog instead, as you’ll see. Scroll down to the bottom of the page — that’s the secret! — and there’s a small search box where you can enter a specific URL or a subset that matches a set of URLs. That’s it. Turns out that there’s a lot you can find out in Analytics if you have the patience to poke around and experiment. I recommend you spend some time poking around! This is outdated, there is no way of tracking a single page I can find. Well done Google for making a simple tool useless! click on “advanced” next to the search box. there you find the filter field described in this post. How do you get the number of hits on a page for all 2013? Ricardo, you just have to change the dates at the top-right corner. You can set them to any time frame you want. 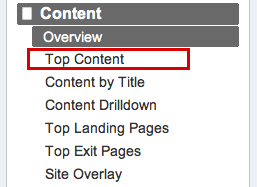 You actually went a step further than you had to in order to view the traffic on one specific page. The search box next to the “advanced” link allows you to search any specific URL on your site. Can you only filter by URL? How about other meta data on a page?